H.J. 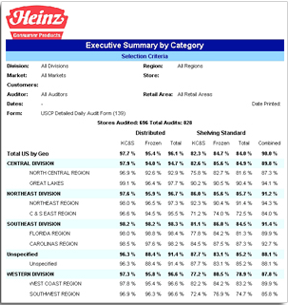 Heinz audits retail stores to monitor the distribution, placement, and display of their products. Previously, Heinz used paper forms to conduct retail audits, which required auditors to spend time typing the results of those audits into spreadsheets at the end of the day. The data would then have to be collated and analyzed by head office, which caused considerable lag time between completing a store audit and reporting the findings to sales executives. Heinz selected Flowfinity Actions seven years ago to replace their paper-based system for performing retail audits with an electronic system implemented on smartphones. Since its deployment, this solution has enabled auditors in the field to record their observations directly on their smartphones, with or without cell phone coverage, and submit the results as soon as the audit is complete. Automated reporting eliminates the need for head office to manually collate the data, enabling management to pull both detail and summary reports on demand. Today, Heinz continues to use Flowfinity Actions, the CPG industry standard solution for retail audits, and has extended its use of the software to gain even more visibility into retail operations. "It was relatively simple to match up everything the retail business managers did with a paper audit to an electronic format using Flowfinity Actions," said Eric Ginsburg, Foodservice Sales Information Manager, H.J. Heinz. "When we added the reporting component so we could utilize the data collected from the audits, we knew we had something great." "I would say using Flowfinity Actions saves me about two hours per day by not having to key everything in to a computer at the end of a day." The U.S. Consumer Products Division at Heinz is responsible for the performance of Heinz grocery products in retail stores across the country. The division works to ensure Heinz products are on shelves while meeting merchandising objectives set out to maximize sales. This includes the management of third-party brokers who handle the distribution of Heinz products to the various retail channels. 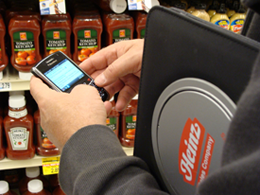 Heinz conducts retail audits in stores to ensure that product displays are in compliance with their objectives. In the past, Retail Business Managers conducted audits by filling out a long paper form. At the end of the day or week, they would have to key in all of the information from the audit form into a spreadsheet and email it to head office, which could take up to an hour per audit. Corporate headquarters was then tasked with compiling data from the audits submitted, analyzing the results in Excel, and manually creating reports that could include analysis of market, region, division, total U.S. data, and more. With this process it could easily take 30 to 60 days for results to reach business decision-makers. "We weren’t getting a great deal of score card information back from our retail audit process," said Ed Bollinger, Director of Retail Operations. "Not a lot of history or trending was being built. That meant sales managers were spending too much time trying to pull the data they needed to understand how our brands were doing at a category, regional or national level." Heinz wanted the ability to improve the efficiency and accuracy of their retail data collection and reporting process in order to positively affect sales, gain the ability to conduct more audits, and improve the feedback loop with brokers. Heinz selected Flowfinity Actions to eliminate paper and provide a robust platform for data collection at the store level, through a process called the Electronic Retail Audit. The solution enables auditors to reliably record in-store observations, whether online or offline, and transmit the results as soon as they are completed. Working in partnership with Flowfinity, Heinz also designed a system to fully automate reporting, greatly improving efficiency of communications and insight into retail conditions. The Electronic Retail Audit provides auditors with a user-friendly, reliable, and accurate method of data collection that eliminates the need to spend time on data entry at the end of the day. This gives employees more time to work on high value activities such as managing out-of-stocks and shelving conditions, working directly with the customer, or spending more time interacting with sales and marketing teams. Beyond improving efficiency of conducting audits, Heinz has increased the number of audits conducted, further improving visibility into their operations. Productivity enhancements have led Heinz to conduct 12,000 audits per year in about 15 different formats, compared to a single type of audit used in the paper system. Data is now collected and submitted in real-time, giving Heinz better visibility into stores and more control to address any issues observed. "It was relatively simple to match up everything the retail business managers did with a paper audit to an electronic format using Flowfinity Actions. When we added the reporting component so we could utilize the data collected from the audits, we knew we had something great." Heinz uses third-party brokers to handle the distribution and placement of their products in retail stores. Since Heinz sets out shelving objectives that are critical to sales, they needed a way to provide timely feedback on broker performance in the field. Now that store observations are submitted daily, Heinz can provide feedback on any issues observed, such as out of stock products, as soon as they occur. "Flowfinity Actions allows us to more accurately and quickly return the performance of brokerage accounts, over a month, quarter, year, or multiple years," said Eric Ginsburg, Foodservice Sales Information Manager. "It’s more robust and responsive than the paper process was. It lends itself to getting to those quicker insights, and allows us to drill home faster as opposed to waiting months to do the analysis." Reporting was a key component to designing the Electronic Retail Audit. To arrive at the best solution, Heinz worked in partnership with Flowfinity to design and architect a reporting system that would meet their need to analyze data across brands, shelving objectives, distribution, out-of-stocks, customers, or other criteria. Heinz now has access to in-depth reports updated daily that can be generated at any time from a reporting website, instead of the previous spreadsheet process that would take weeks for reports to reach sales management. "Before, if we wanted to measure something, we’d have to dig into our files and build a progress report," said Ed Bollinger. "Even then, I might be able to guess at a number based on what I saw. With the new retail audit reports, I can quote to the decimal point how well we are meeting a particular objective." With the new system users have the ability pull reports on-demand based on criteria they select such as date range, brand, customer hierarchy, or year-to-year comparison. A new development introduced last year allows users to combine customers across markets that might not typically been combined, providing even more flexibility to the business user to access meaningful data. "This tool allows users to be more focused and quickly get to the data that they need," said Eric Ginsburg. "Anyone with access to the web server can pick which report they want and it returns a result for them within seconds, as opposed to the paper system which used to take weeks. An added benefit is that reports are downloadable, and can be migrated into Excel or PDF formats." "Anyone with access to the web server can pick which report they want and it returns a result for them within seconds, as opposed to the paper system which used to take weeks." In addition to conducting regular audits, the U.S. Consumer Products Division now has the ability to quickly design and deploy even more custom audits for specific retail channels or special events such as feature and display events and Superbowl blitzes. This ability to formulate and conduct ad hoc audits has given Heinz further insight into the performance of different channels and specific campaigns. Heinz has implemented a system within Flowfinity called Quick Audits that allows non-technical personnel to create an audit form, submit it for approval, and seamlessly push it out to auditors in the field. Users appreciate receiving updates on-the-fly without having to login to a computer. And pre-designed, standardized reports eliminate the need to spend time creating a custom report for every new audit. "Quick Audits is about empowering the users to create their own forms, and they love it. It’s very efficient and very easy to use." "Quick Audits is about empowering the users to create their own forms, and they love it. It’s very efficient and very easy to use. And now that everything is in place, training a user on the system is minimal – it only takes about a half hour," said Ginsburg. As a Flowfinity user for seven years, Heinz continues to expand the use of the tool to streamline business processes. Future plans include considering the adoption of other mobile devices such as tablets into the Electronic Retail Audit, which Flowfinity automatically supports, preserving the value of the investment they have made in the current system. Tablets for example, can be used for all existing audit-related tasks plus they open new opportunities for rich media presentation like marketing and training videos. This leads to another opportunity Heinz is pursuing to use Flowfinity Actions to publish information such as product specifications, display standards, planograms, market data, training materials and marketing campaign announcements to staff in the field. Being able to use the same software product to deploy these new capabilities will continue to enhance the overall ROI of the Flowfinity solution. Now, I get an accurate picture of exactly how our products are presented to customers so we can do a trend analysis over time. Decision-making flows much easier up the ladder because I can present the numbers that will get peoples' attention. Ultimately that means we can influence consumers in a much deeper and richer way.